For its 2019 Annual Convention, the ERA will visit three transit hotspots of the South and Southwestern U.S. for the first time — Tucson and Phoenix, Arizona, and El Paso, Texas. We will spend two days at our convention headquarters in Tucson, then travel on Amtrak’s Sunset Limited from Tucson to El Paso. 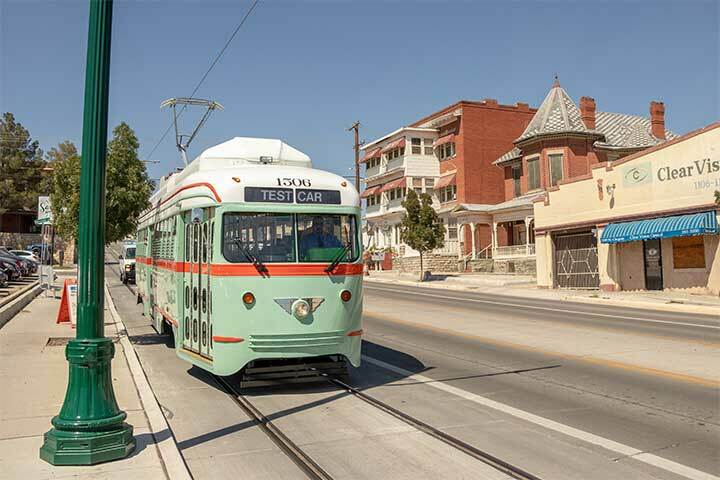 Carl Jackson, who managed the construction and launch of the El Paso Streetcar, will be the keynote speaker at our Annual Banquet in the DoubleTree by Hilton, Downtown El Paso hotel, our El Paso Headquarters. This part of the United States is new territory for ERA annual conventions. And it is only our third convention featuring Amtrak intercity travel. You will not want to miss this special convention, so book today! For 2018, the Electric Railroaders’ Association returns to the San Francisco Bay Area for its four-day convention over the Labor Day weekend. It was 2004 when we last held our convention here and a lot has changed. 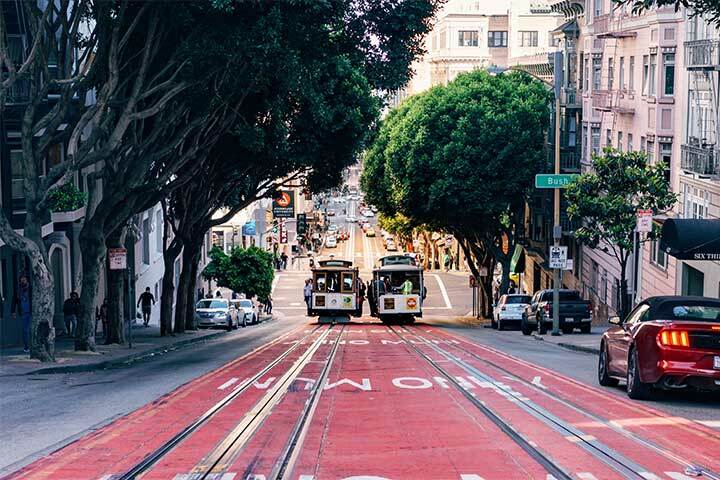 The convention will feature streetcar charters, shop tours, a ride on the new Sonoma-Marin (SMART) and eBART diesel commuter rail lines, provision for a ferry ride, two museums, and just the right amount of time on your own with a pre-loaded Clipper Card. The 2017 ERA Annual Convention will take place in two cities, Atlanta from July 1–4 and New Orleans for July 4 and 5. Highlights of this year’s convention will include riding the new Atlanta Streetcar through the Martin Luther King historic district, a tour of the MARTA heavy rail shop, a visit to the famed Southeastern Railway Museum, and a tour of New Orleans’ comprehensive streetcar network starting with North America’s oldest railroad, the St. Charles Streetcar (1835). This is ERA’s first visit to these two dynamic metropolitan areas, making it a convention not to be missed! For its 2016 Annual Convention, the ERA will return to the Washington metropolitan area this Labor Day weekend after an absence of almost 30 years when the 1987 convention was held in Baltimore. From our convention headquarters at the Crystal City Marriott in Arlington’s Crystal City neighborhood, we’ll visit numerous rail-related sites in and around Washington, Baltimore and Norfolk, Virginia. The 2015 Annual Convention will be held on Labor Day weekend, September 3–8, 2015, in Houston, Austin and Dallas / Fort Worth. We will have two luxurious convention headquarters: the Magnolia Hotel Houston from Thursday to Saturday, followed by the Magnolia Hotel Dallas, site of our 2015 Annual Banquet on Monday. Activities will include a tour of the entire 22-mile Houston METRORail network, a tour of DART’s light rail Central Maintenance Facility in Dallas and a visit the Plano Interurban Railway Museum. The 2014 Annual Convention will be held on Labor Day weekend, August 30–September 2, 2014 in Minneapolis and St. Paul. The luxurious Hotel Minneapolis will be our headquarters and the site of our 2014 Annual Banquet. Activities will include an excursion along Lake Superior aboard the North Shore Scenic Railroad, a ride on the Minnesota Streetcar Museum’s Como-Harriet Line, and tours of both Metro light rail lines. Be sure to block out the weekend on your calendar and plan to join us for another memorable convention. The 2013 Annual Convention will be held on Memorial Day weekend, May 24–30, 2013 in Denver and Salt Lake City. The luxurious Magnolia Hotel will be our headquarters in Denver and the site of our 2013 Annual Banquet. We will spend three days in the Mile High City, then spend a day riding to Salt Lake City on the California Zephyr, one of the world’s most magnificent train journeys. Our home base for the following two days will be the AAA Four Diamond-rated Little America Hotel. Be sure to block out the weekend on your calendar and plan to join us for another memorable convention. The 2012 Annual Convention will be held on Labor Day weekend, August 30 to September 4, in Boston. We will return to downtown Boston’s historic Omni Parker House Hotel as our convention headquarters. Full details and applications will be on this website and mailed to all members and friends well in advance. In the meantime, be sure to block out the weekend on your calendar and plan to join us for another memorable convention. 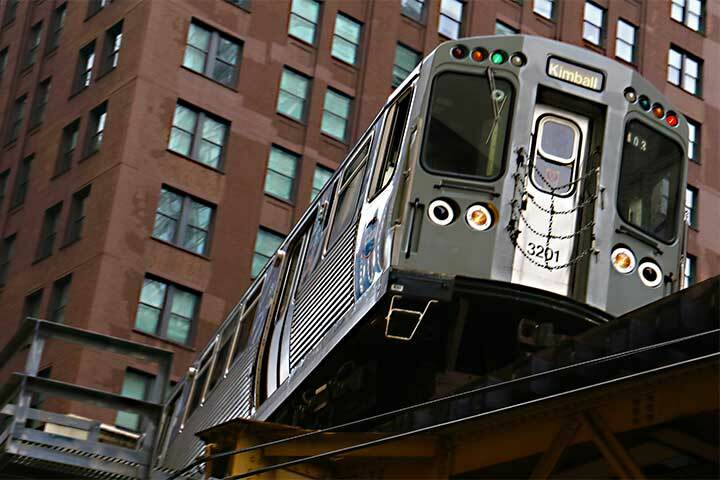 Chicago is one of North America’s most popular traction and tourist destinations and the site of the 2011 Annual Convention. The Chicago Marriott O’Hare will serve as our convention headquarters. 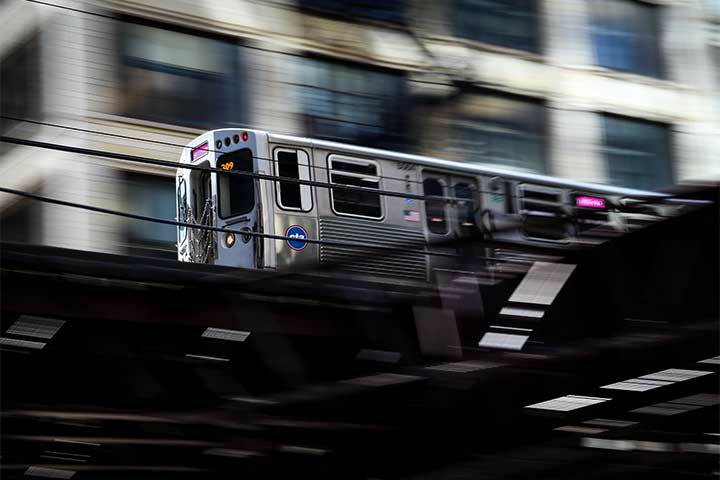 The Greater Chicago area is home to four outstanding electric railroad museums and heritage operations, and one of the nation’s oldest and most comprehensive rapid transit and commuter rail networks. Portland, with five light rail lines, a streetcar, an historic trolley and more, is the exciting site of the 2010 Annual Convention. Our convention headquarters will be the Courtyard Portland City Center, a Marriott hotel in downtown Portland. Activities will include a visit to the Oregon Electric Railway Museum in Brooks, a ride on the Mount Hood Railroad, chartered streetcar trips on both the Portland Streetcar and the Willamette Shore Trolley, and much more. The Greater Los Angeles region, home to one of the world’s greatest and most extensive urban rail systems, is the site of the 2009 Annual Convention. The Wilshire Grand Los Angeles will be our convention headquarters. Activites will include a tour of the Orange Empire Railway Museum, a trip to the Gold Line Shops and San Pedro Heritage Trolley, and more. Philadelphia, a hotbed of electric traction with streetcars, elevated and underground rapid transit, suburban MU operation and electrically-propelled intercity trains, is the site of the 2008 Annual Convention. The Crowne Plaza Hotel Philadelphia Center City will be our convention headquarters. Activities will include a visit to the Rockhill Trolley Museum in Orbisonia, a heritage PCC fantrip throughout West Philadelphia, and a NJT River Line charter and shop tour. St. Louis is the site of the 2007 Annual Convention. The Crowne Plaza Hotel will be our convention headquarters. Activities will included an excursion to the Midwest Electric Railway, a MetroLink Light Rail shop tour and ride, and a visit to the Museum of Transport. There will be a Memphis/Little Rock Excursion with private charters of the Main Street Trolley and Riverfront Loop heritage line in Memphis and the River Rail heritage line in Little Rock. Our excursion headquarters will be the Comfort Inn in downtown Memphis. Edmonton and Calgary, the two cities that began the revival of light rail in North America in the late 1970s, are the sites of the 2006 Annual Convention. Our convention headquarters will be The Westin Edmonton in downtown Edmonton and The Sandman Hotel in downtown Calgary. 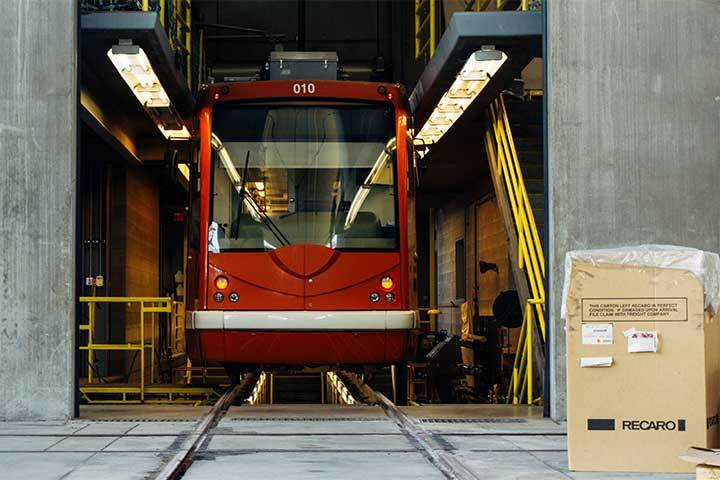 Activities will include a fantrip on the Edmonton Radial Railway Society’s High Level Bridge streetcar operation, a chartered Light Rail Vehicle covering the LRT line and a tour of the system’s carhouse and shop. Houston and Dallas are the sites of the 2005 Annual Convention. Our Houston convention headquarters will be the Houston Marriott Medical Center and our Dallas convention headquarters will be the Hampton Inn Dallas-West End/Convention Center. Houston activities include a day trip to ride Galveston’s diesel streetcar line and a trip to Houston’s new MetroRail Light Rail Storage and Maintenance Facility. In Dallas, we’ll take a tour of the DART Red and Blue lines aboard a private LRV and visit the Texas Electric interurban museum in Plano. San Francisco is the site of our 2004 Annual Convention. Our convention headquarters will be The Best Western Canterbury Hotel. Activities will include a ride on the San Jose light rail line, a visit to the Kelly Park trolley museum, an all-day Municipal Railway streetcar fantrip and a visit to the Rio Vista Trolley Museum. Toronto is the site of the 2003 Annual Convention. Our headquarters will be the Days Hotel and Conference Centre. Activities will include a riding streetcars, light rail and heavy rapid transit, and something in between, the Scarborough line. The Electric Railroaders’ 2002 Annual Convention was held July 4–7 in Portland, Oregon. We took excursions to other nearby places of traction interest such as Yakima, Washington and Astoria, Oregon. Jack May worked hard on putting the convention package together. The 2001 Annual Convention, held in Chicago, was one of our most successful to date. We visited the Illinois Railway Museum; the new PCC streetcar operation in Kenosha; the East Troy Railway Museum, and the Fox River Railway Museum. We also had fantrips on the Chicago Rapid Transit system on two different days. A particular highlight was our excursion on the Douglas Park Line, which was held on a Saturday.